This is a simple warming dish, easy and cheap. 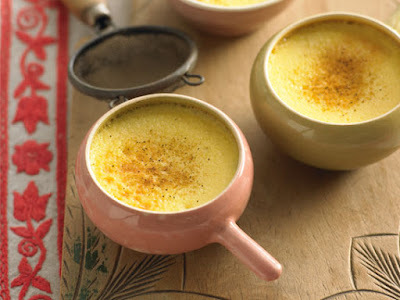 Remember this is cooked in a "water bath" and you need to remove the custard as soon as you can tap it with a knife and it is wobbly solid or the eggs will curdle. You can bake it in one big dish or single serving dishes - just remember small dishes will cook faster. Beat the whole eggs, egg yolk and vanilla extract together lightly (you don't want them to become too frothy). Place the cream in a pan with the sugar, stirring to dissolve. Heat to just below boiling point then pour onto the eggs and stir to combine. (you can do this in the microwave – 1 minute) Strain through a sieve into a 1-litre (4-cup) capacity baking dish or individual oven proof dishes. Stand in a roasting pan half-filled with hot water. Sprinkle the top with nutmeg. Bake for about 30-35 minutes: it should still wobble slightly. Remove from oven and serve hot or cold as desired. Really beautiful with steamed fruits.